Based on a successful business park, benefiting from landscaping and great links by road and rail, this office development boasts high grade facilities, a light and spacious modern environment with a full complement of business support services. Available on flexible terms, this sought-after office accommodation provides all the benefits of an out-of-town location, such as plentiful parking with close proximity to Reading and the M4. Nearby Theale station provides public transport direct to London. Based in the popular Arlington Business Park, this accommodation offers a range of benefits and excellent transport links. Services available include a fully staffed reception, leading edge communication technology and parking facilities, all within a landscaped lakeside setting. 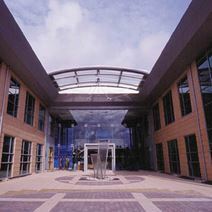 The centre is convenient for all transport, a few minutes’ from Reading mainline station and access to the M4 at J12. Wider links to the region include London and Heathrow. Space is available in this sought after business environment with a whole range of enviable benefits and a striking modern design. These range from services provided by a friendly and dedicated team; excellent investment in communications technology; security systems and plentiful parking, along with an on-site Starbucks. Fantastic transport links include the M4 and Theale railway station, both just minutes’ away. This business centre supports excellence in its community and aims to meet all of your company's needs.